Imagine this. You're exploring an old city cemetery during the early evening hours. You like this time of day because of the softly muted light. You're taking photos of an interesting monument and thinking intellectually deep thoughts about macro shots, f-stops and ISO settings -- you're in the zone. If you lean at this angle, is the depth of field too shallow or should you maybe bump it up to . . . and suddenly from behind you comes a deep bass "EXCUSE ME." What do you do? Turn around smoothly with an air of cool authority that says clearly, you wouldn't DARE accost me? Or instead make a weird little strangling sob sound that is shorthand for, my purse is on the front seat of the car? What did I do? Oh as if. Option B, naturally. Just about dropped my stupid camera, I did. Much to my relief the interruption to my artsy musings was merely a young college student from the adjacent University of Dayton who was taking his evening constitutional through Woodland Cemetery. Although I did make clear that I HAVE MY DOG IN THE CAR. Perhaps a little too loudly. Thinking this may thwart any untoward thoughts against my chubby, middle-aged person. The young man was merely curious, he heard stories about a haunting at Woodland. Something about a boy and his dog. He couldn't help but notice that I was taking photos of a monument of the same. Taking photos is right. I was trying to get a macro shot of the stone dog's nostrils (f-stop, depth of field . . .) when he caused me to jump out of my skin. But more on dog nostrils later in the post. So, what's the story on the boy and his dog; did I know? Are you kidding me? Heck yes, I know. Just give me a sec here to swallow first so I can get my heart out of my Adam's apple, though. Have a seat, young man and I'll tell you a story. In the late summer of 1860, 5 year old Johnny Morehouse was playing with his dog near his father's cobbler shop in downtown Dayton, Ohio. Dayton was still a young city then and relied on the nearby river and the Miami & Erie Canal system for commerce with other Ohio cities. This was all before the Great Flood of 1913 when folk still had a tentative trust in the Great Miami River. Johnny went against his mother's warnings and was playing too close to the canal, when he fell into the dark water. His dog jumped in after him and tried in vain to save him. But Johnny Morehouse drowned on that summer day of August 14, 1860. Johnny was laid to rest later that week in Woodland Cemetery. 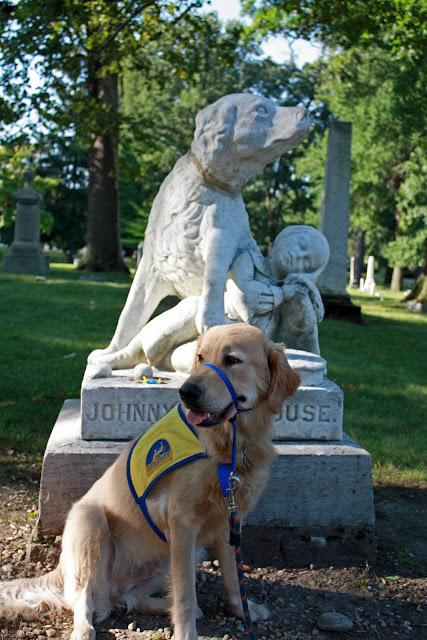 Legend has it that his dog stayed at the gravesite, refusing to leave. People would come by to bring food and water to the dog. Then one day, the dog was gone and never seen again. It's said that in late summer, at the last light of the day when the cemetery gates have been locked, you can hear a boy laughing and playing with his happily barking dog. Johnny's father was a cobbler, not a rich man by anyone's standards. The family could not afford a grave marker, even a modest one, for their only son. But a local businessman, Daniel La Dow, had heard the story of Johnny's valorous dog. La Dow was a stonecutter and owner of a prosperous marble works in the city. He designed and created the remarkable monument that is at Johnny's gravesite. 'Tis truly a work of art that is not duplicated anywhere else within our fair city. Take a break, hero dog. I got this. The monument has no dates on it - no date of birth nor death. The only inscriptions are Johnny's name and the words Slumber Sweet. We see that after 150 years, the dog remains vigilant with a protective paw over the young boy as he sleeps. Forever to be alert and watchful in stone. At their feet are Johnny's cap and the toys found in his pocket that sad day. His ball, a top and harmonica. Woodland Cemetery states this is their most visited gravesite - and the most decorated. 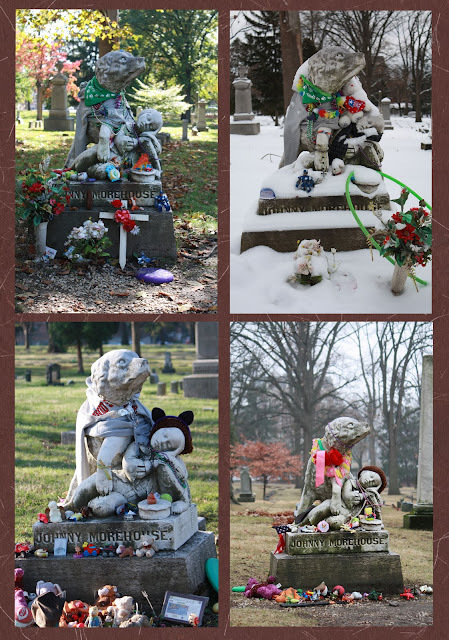 The site changes daily as families come by to pay their respects to this lost boy by leaving toys, trinkets and clothing. These items are later collected and donated to charitable organizations. To avoid cracks in the stone due to temperature changes, La Dow included an air vent inside the monument. This is a rather clever design as the air is released through the dog's nose. It is true that if you hold your hand near the dog's nostrils, you can feel it "breathe." In cooler weather you can see steam coming from the nose. What's really surprising to me though, in that in spite of the legends of this boy and his dog (I've only shared one story), we don't know the dog's name. This is lost to history as well as the dog's breed. I don't know, it seems disrespectful to me to even nickname this boy's dog. But what kind of dog is it? Isn't it obvious? Love, responsibility and never ending devotion? It's got to be a Golden/Lab cross, don't you think? This story makes me cry every time I hear it. Thanks for sharing, especially the great photos.